For passersby on East Main Street, recent months have presented the riveting spectacle of demolition and earth-moving at the former Duncan Oil Company. The complex undertaking marks a new chapter for Franklin’s river district and for Mainspring Conservation Trust, which has its headquarters in a former retail building next door to the site. Mainspring (formerly Land Trust for the Little Tennessee) has dedicated itself to conserving important natural and cultural sites in Macon County and the region since 1995. But, this was its first brownfield project – and it was a particularly complicated one. As the site borders the river for 350 feet and is part of ancient Nikwasi village, it presented archaeological concerns as well as environmental ones. In addition, Mainspring felt an obligation to restore the area in a way that would enhance the attractiveness of the emerging “River Gateway” district. This section, in the bottomland of the Little Tennessee, remained largely agricultural for much of Franklin’s history. Then, in 1907, Tallulah Falls Railroad chugged into town, built a depot on what became known as Depot Street, and stimulated industrial development along the riverfront. Still, the district was mostly farmland until after World War II, when returning soldiers sought space for new enterprises. According to an article in the Franklin Press (Oct. 8, 1964), post-war business expansion took place largely in the bottomlands because Franklin had little other “stretching room.” Developers brought in fill and dumped it on East Franklin lands in an effort to raise the surface above the floodplain. Duncan Oil, one of those postwar businesses, would supply the energy needs of the region for half a century. A bulk or distribution pump, two buildings, and 32 storage tanks, both surface and underground, sprawled across its 1.38-acre site. Over the years, some of the fuel – diesel, kerosene and gasoline – leaked into the ground, creating what is now called a brownfield. 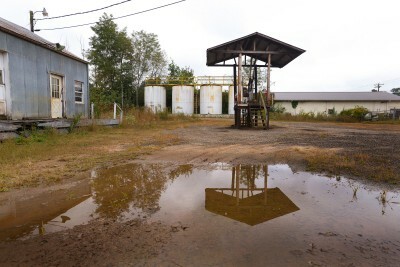 The Environmental Protection Agency (EPA) defines a brownfield as “real property, the expansion, redevelopment, or reuse of which may be complicated by the presence or potential presence of a hazardous substance, pollutant, or contaminant.” Strict regulations, designed to protect public health and the environment, apply to properties with this kind of contamination. Its position as next-door neighbor to the property, and its history as a nonprofit with experience in property acquisition and maintenance — not to mention its mission of land and water conservation — drew Mainspring into the story. The work observers noticed at the Duncan site was just part of a long-term restoration effort that began more than three years ago. Before the first shovel could hit the dirt, Mainspring had its hands full preparing for the project: acquiring the property, seeking grant funds for the cleanup, reaching a brownfields agreement with the state and developing in-house expertise. These tasks fell into Phase 1 of the project. Funding came from EPA and Cherokee Preservation Foundation. The task of becoming resident expert fell to Ben Laseter, Mainspring’s associate director. Laseter came to the organization with a Ph.D. in wildlife management and experience with an environmental consulting firm. He spent his first three years at Mainspring as restoration coordinator. The brownfields project called on all his expertise in project management, and presented a big learning curve in the ins and outs of brownfields. He says that he found this daunting process highly enjoyable. The second phase of work began on the ground in November 2015, with removal of three underground tanks. The bulk of the remediation began at the end of June 2016, and finished in September. The process included excavation and removal of more than 3,200 tons of contaminated soil located under and around 32 storage tanks, along with the excavation and grading of a riverside path on the west side of the river. Because of the site’s sensitivity as part of old Nikwasi, the work had to be monitored to ensure that nothing of archaeological significance was disturbed. Ben Steere, assistant professor of anthropology at Western Carolina University, was brought in to oversee that aspect of the job. “Mainspring is to be commended for consulting with the Tribal Historic Preservation Office of the Eastern Band of Cherokee prior to starting this project, and for making every effort to protect the archaeological resources at the site during the remediation,” Steere said. He found that the project offered a “rare opportunity” to understand the history of landscape modification in the Nikwasi village area. What they found during the remediation was astounding: 13 feet of fill. Some of that had been brought in to raise the site during the postwar development period, but much had also been contributed by the river itself. Contamination did not reach down to the original surface, under which rich archaeological deposits are believed to lie. Thus, the fill provided an unanticipated service in protecting the earliest history of Franklin. Nothing of archaeological value was disturbed during the remediation, and no artifacts showed up in the fill that was removed. Two additional phases of work are planned, to develop the site as an educational resource and public space that furthers the revitalization of the River Gateway. With this end in mind, Mainspring saved four large, above-ground tanks that landscape architect Zeke Cooper foresaw as having a potential for public art. Taylor sees the tanks as a way to recognize the industrial history of the site, while telling the story of the land trust in a graphic way. Mainspring has not yet decided on the particular form this art will take, and may be seeking public input, she said. Laseter points out that the location offers a direct line of sight to Nikwasi Mound, and thus offers an opportunity to tell the story of the area’s earliest inhabitants. A pavilion on the site will provide an outdoor classroom facility. The location is also near the only missing piece of the Greenway, Taylor notes. A small section across the river from Mainspring, from the southeast corner of the bridge to the trail entrance behind East Franklin Shopping Center, is on private land (NCDOT acquired one parcel for use during bridge construction). One dream for future development of the Duncan tract envisions a footbridge that would provide a direct connection to the Greenway. Implementation of Phases 3 and 4 has been delayed because contamination turned out to be greater than originally thought, and money that had been set aside for those uses had to go into remediation, which was the greater need. Additional funding is being sought to complete the original vision. Mainspring is getting help with that vision from Mountain Partners. This group of people from Macon County and Cherokee is facilitated by Mainspring and supported by funding from Community Foundation of Western North Carolina, Z. Smith Reynolds Foundation, Cherokee Preservation Foundation and private donors. They have been meeting since May 2015 to discuss a range of issues related to heritage tourism – specifically focusing on their common cultural interests. What has come out of those discussions is a determination to create a heritage corridor from Nikwasi to Cherokee. Franklin’s River Gateway, which includes Nikwasi Mound, Big Bear Park and the restored Duncan property, would be a natural first stop for visitors wishing to explore the Native and early settler history of the region. On its way to Cherokee (and beyond), the corridor will spotlight cultural sites such as Historic Cowee School Arts and Heritage Center, the surrounding Cowee-West’s Mill Historic District and nearby Cowee Mound. Mountain Partner’s first project will be a visitors’ site on the Little Tennessee River, across from Cowee Mound. It will include a viewing platform and educational kiosks to describe the scope of that historic site, which was an important Cherokee village as well as a Revolutionary War site and, later, home to early Macon County settlers. Work on this project is slated to begin soon. When Mainspring moved into its present facility in 2012, it had a “vague” vision and idea of being an agent of change in the aging commercial district that surrounded it. The closeness of Nikwasi Mound, the Greenway and the Little Tennessee River resonated with the nonprofit’s core mission of conserving the region’s important cultural and natural resources. The Duncan tract raised the bar on Mainspring’s restoration ethos, becoming one of its most visible-ever projects and its first brownfield site. Its potential as a welcoming public space presents an opportunity to further the educational portion of the Mainspring mission. And, in the process, Mainspring is making a sizable contribution to the emergence of a river district that has the potential, backers say, to revitalize this long under-appreciated section of the town. A second East Franklin brownfield site, the Simpson Oil tract, is next on Mainspring’s River Gateway list. This 0.6-acre property, located directly across the street from Mainspring, sits between the eastbound and westbound lanes of Main Street. The property is under contract and Mainspring has entered it in the state’s brownfield program. Although its future use has not been set in stone, Taylor thinks the “highest and best” use will likely be green space. Other recent changes include NCDOT’s purchase of a former package store near the bridge and its demolition, which has contributed to the new openness of the area. With these and earlier improvements – including attractive landscaping at FROG Quarters and Mainspring — and scheduled projects, such as the highway bridge that slated for construction soon, the section is beginning to live up to the promise of its new billing as Franklin’s River Gateway.